Antibody supplement for newborn lambs less than 24 hours of age. 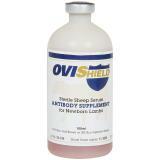 Supplement contains antibodies from healthy, vaccinated, certified sheep. 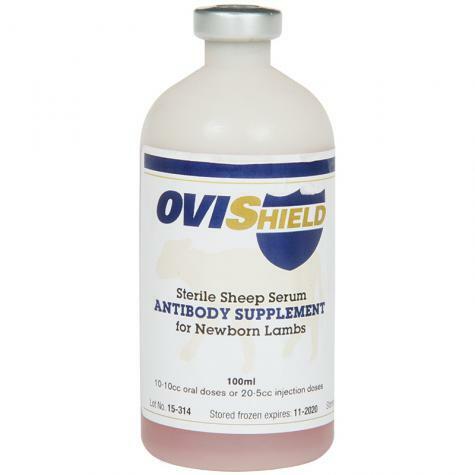 Studies demonstrated that OVIShield is safe to use in newborn lambs. *This product requires refrigeration and must ship via an Air Service. Vaccines and cold products are shipped Monday through Thursday. Freight costs will be calculated during checkout. Please select an Air Service (Next Day or 2-Day). Available for sale in the US only. Cannot ship to PO Boxes or APO military addresses. No returns on vaccines and cold products. The sterile serum supplement which is rich in antibodies may be give orally or as a subcutaneous injection. Oral use: Mix 10 cc dose of supplement with ewe's colostrum supplements or lamb milk replacer. Feed with Lamb 'N' Kid Feeding Bottle or stomach tuber. 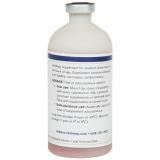 Subcutaneous Use: Aseptically inject a 5 cc dose of supplement subcutaneously.